The newest addition to our chimpanzee group, Scooter, is now going out in the yard in the African Forest. Scooter arrived in October from a zoo in Nebraska and the primate team has been slowly introducing him to members of the group. 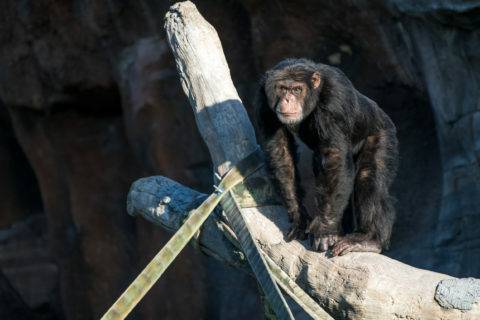 He now has been introduced to six chimpanzees (Charlie, Chaos, Tanzee, Kira, Kenya, Sierra) and has been exploring the outdoor exhibit with his new friends who are showing him around. You may have noticed there have been fewer chimps out on exhibit lately, and this is because we now have two groups, or on many days, three small groups rather than one large group. It will take us several more months before we can fully integrate Scooter, so this will be the case for a while. During this process, we will have a highly variable schedule for which chimps will be outside as we continue to introduce him to new friends. 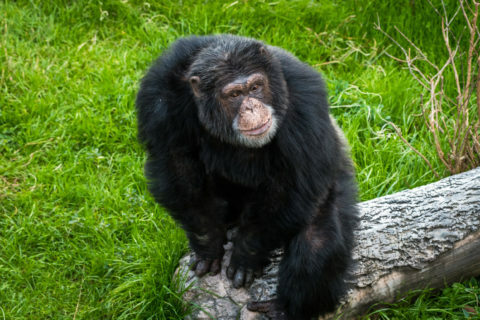 When Scooter is outside, he will be hard to miss as he is easily the largest chimp in the group and can often be found interacting with guests. Look for Scooter on your next visit to the Houston Zoo! Just by visiting the Houston Zoo you are saving animals in the wild. The Houston Zoo helps save chimpanzees in the wild by partnering with the Jane Goodall Institute’s Tchimpounga Chimpanzee Rehabilitation Center in the Republic of Congo for the care of orphaned chimpanzees.